From 1972 to 2000 Dr. Vernor Vinge taught math and computer science at San Diego State University. In 1982, at a panel for AAAI-82, he proposed that, in the near future, technology would accelerate the evolution of intelligence itself, leading to a kind of “singularity” beyond which merely human extrapolation was essentially impossible. Vinge sold his first science-fiction story in 1964. His novella TRUE NAMES (1981) is one of the earliest stories about cyberspace. RAINBOWS END (2006) looks at the implications of wearable computing and smart environments. Vinge has won five Hugos, including three for best novel. His latest novel is THE CHILDREN OF THE SKY. My most recently published book is THE CHILDREN OF THE SKY from Tor. It’s a direct sequel to A FIRE UPON THE DEEP. Henry: I’ve read DEEP, and thought it was immensely creative. I hope the readers get a good time and be inspired to think about ideas and issues coming from the story (mainly light-hearted consideration of the nature of mind and social structures). By far, writing the first draft! For me (and most people, I’ll bet) it’s difficult to create something where nothing concrete was before. Henry: Right with you on that one. Planning is fine and ideas are important, but very often the magic happens in the contingency of writing individual scenes — and even individual sentences. I would have missed out on meeting a number of cool people. My own aspiring author stage is at least one technological/publishing revolution in the past, so there’s a lot I’m not qualified to give advice about. However, I think that Heinlein’s writer advice is still valid and very important (e.g., as related by Robert J. Sawyer at http://www.sfwriter.com/ow05.htm). I don’t think my rituals are especially strange, but since writing that first draft is very difficult to me, I do need fairly strict rules (even as to exceptions to the rules) for getting through each writing day. So there are goals and policies (5 days a week, 1500 new words a day, but those 1500 words are allowed to be flawed). Henry: See also Sheldon Cooper’s roommate agreement. Track current science/tech, especially astronomy and computation. Henry: Do you ever apply your advanced computational skills in Las Vegas? 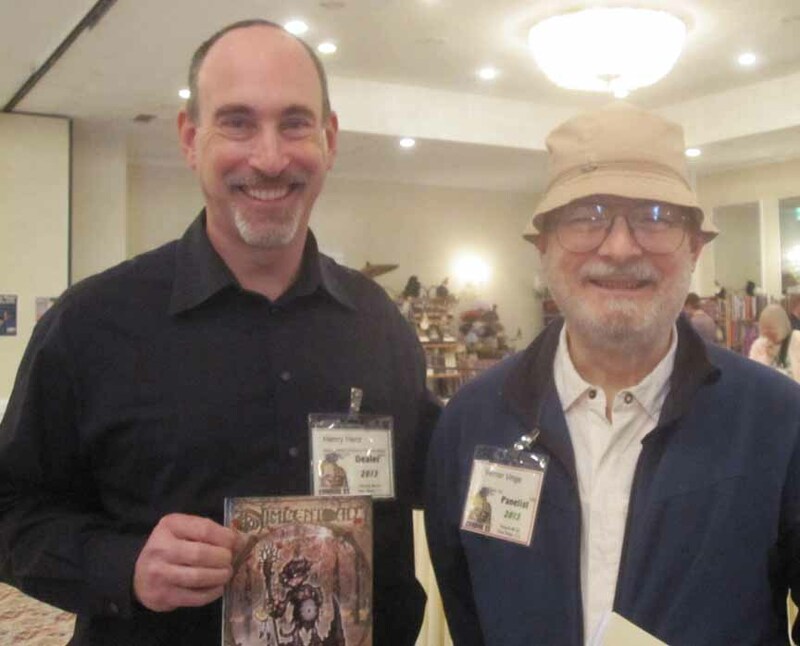 Henry: I’ve had the pleasure of meeting Dr. Vinge, and I’m tickled to say I’ll be on a panel tomorrow at San Diego Comicfest with both he and Dr. David Brin. I’m not worthy. Categories: Books, Science Fiction | Tags: author, Hugo Award, interview, science, science fiction | Permalink.